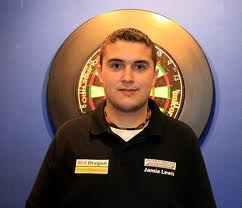 Young Welshman Jamie Lewis started to play darts when he was eight years old. From 2007 he stood in the limelight as a BDO youth player. He won two times the Youth World Masters, once the Youth World Cup and several other tournaments. Three years he was the captain of the Welsh youth national team. 2011 he started to play the PDC Youth Tour and reached the quarterfinals of the PDC Youth World Championship. In January 2012 Lewis took part in the PDC Qualifying School teil and secured himself a Tour Card. In June 2012 he won a Youth Tour Event in Germany. Lewis qualified for the UK Open 2012 and the third event of the European Tour in Düsseldorf.